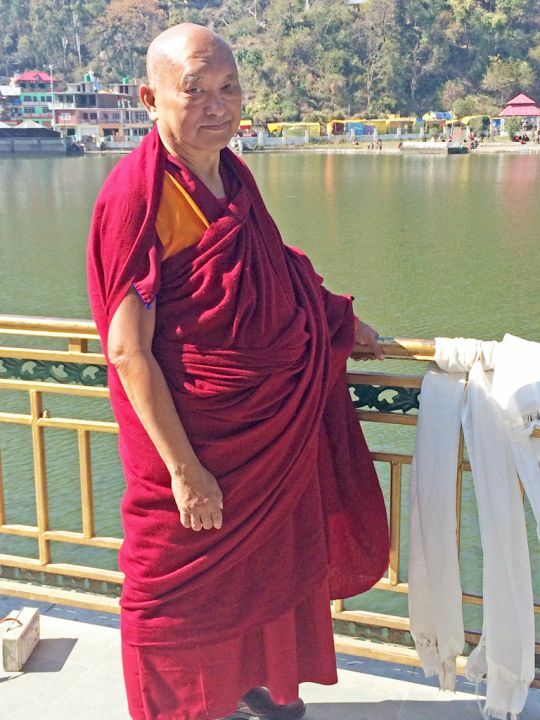 Lama Zopa Rinpoche at Tso Pema, India, February 2016. Photo by Ven. Holly Ansett. I am very sorry how long it took to reply to your request and kind letter. I checked. Would you recite these two mantras, one mala a day? (It is on page 19 of The Method to Transform a Suffering Life into Happiness (Including Enlightenment). Anyone who recites the name of this tathagata and memorizes the words of this mantra will have all their wishes fulfilled. Reciting both the name and the mantra brings success. If you do one mala a day of this practice, if you can do it first thing in the morning, it is excellent. The most important thing is to put effort in tong–len practice. You need to purify all the defilements, which cause obstacles, and to collect extensive merits for success, and not just only for your legal and economic issues and joblessness. It is not just to solve that. That is nothing. That is just for this life. Here, ”success” means for success in all the future lives, to not be reborn in lower realms when you die; to receive a deva or human rebirth; to be born in a pure land and to meet the Dharma, the Mahayana tantra teachings; in all the future lives, to meet perfectly qualified virtuous friend; to be free from the oceans of samsaric suffering; to achieve ultimate liberation – not only that, as that is just for yourself – but to achieve enlightenment, the total cessation of all the obscurations and completion of all the realizations for the numberless sentient beings, to free the numberless sentient beings from oceans of samsaric suffering and to bring them in peerless happiness, the total cessation of all the obscurations and completion of all the realizations. For all these reasons you have success. These are the most important reasons to have success. If you do tong-len practice, then as I explained, it is a way to collect the most extensive merits and greatest purification. This is so much more important than you making a billion dollars every minute of your life. Every minute of your life making a billion dollars is nothing. We are the same suffering sentient being as was Shakyamuni Buddha, so why did Shakyamuni Buddha become enlightened before us? Because Buddha was able to cherish others and let go of himself. We didn’t change our mind that is always cherishing ourselves and giving up others, who are numberless. So, we are still suffering in samsara, even though we were same as Shakyamuni Buddha before. Buddha let go of himself and cherished others, and achieved full enlightenment. We are still suffering, but still we haven’t changed the mind, still only cherishing the “I” and letting go of others, who are numberless. First thing in the morning, it would be good if you can do The Method to Transform a Suffering Life into Happiness (Including Enlightenment) with the mala of mantras and also tong-len. If you want to change your life, then this will make a huge difference. It will change your life from kaka into gold, from iron into diamond. I checked and also I am going to do some practices for you: two times I will recite the Arya Sangatasutra and also eight times I will recite the Mantra Promised by Tara. Please continue to make your life most meaningful with the thought of bodhichitta day and night and in every action that you do. Scribed by Ven. Holly Ansett, Lake Tsopema, India, January 2016. Edited for inclusion on FPMT.org.